Eleven years ago right about now, I became a little bit of a worrier. That is when it all changed. Eleven years ago right about now, I was pregnant with my first child. I worried about the foods I ate, the amount of weight I gained. I worried about second hand smoke from the person smoking across the street. I worried about standing too close to the microwave. That's what a good parent does right? Worry. Over the last 11 years, I've been very lucky. I've had four healthy children. Sure, there were ear infections, rashes, a minor hernia surgery, Swine Flu scares and even a diagnosis of Celiac disease. But over the years, I relaxed and rolled with the punches, er, germs. That's what a good grown-up parent does right? Worry less. I was maturing. I was parenting. But then JT went and broke his arm. I felt like a newbie parent all over again. The anxiety, the worry came back. I joke that I wish I could wrap him in bubble wrap, but the thing is, I 'm not joking. 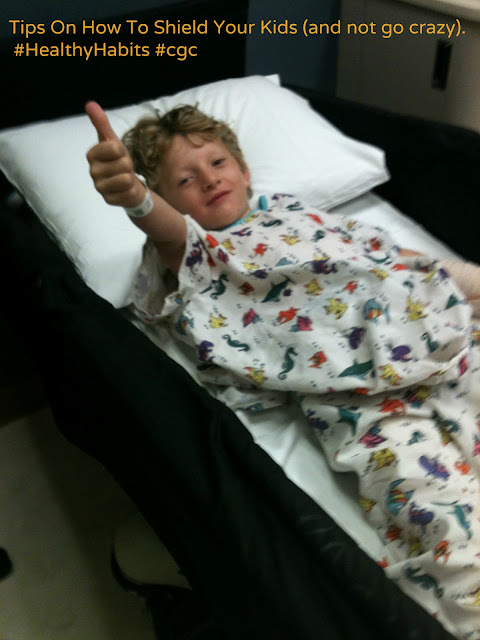 "Oh it's just the beginning," the ER nurse told me as she smiled knowingly and put the splint on JT's broken little arm. "I had three boys. Broken bones, stitches, you name it." "It's not just boys!," another nurse lauged along with her friend. "I had two daughters who were just as reckless and accident prone. It's kids." They laughed together and looked at me with a "just wait, honey, you are in for it" look. All these looks. All these worries. I wanted to grab my baby boy and the bubble wrap and head for the hills. But even the hills are dangerous. Ugh. After a couple weeks with JT in a cast, I've had a little time to analyze my situation. Those nurses are right, I'm in for it. But that doesn't mean I am doomed to a life of paralyzing fear and anxiety. -I was so NOT prepared for something bad to happen. I am not suggesting you walk around waiting for the sky to fall Henny Penny style. But know that bad things can happen to good, cute little people and leave the bitterness at the door. Accept that you are strong enough to deal with life "stuff" and don't be afraid to ask friends and family for help. Be prepared, with a kit. -Have a first aid kit in your house, in your car. Sounds simple, but lots of people (um, me) don't have a first aid kit at the ready. -We fill out emergency cards all over the place for our children, but what about at home? Who is your emergency contact? For example, who is your someone that will watch your other kids while you go to the hospital in an emergency? -Being the mother of an almost 11-year-old, I realize how important it is to teach kids to be responsible for themselves, but also to help out. When JT broke his arm, the older kids and I were a team. Peyton grabbed the baby and helped ease my mind. Lucy talked to JT throughout the ride to the hospital helping him from going into shock. -Always, I mean always, carry hand sanitizer in your purse. Not only will it zap any scary germs lurking, um everywhere, it will give you a sense of control and ease anxiety and worry. For example, I could not fix JT's arm, but I could sanitize the hell out of our hands in the ER waiting room. You better believe that helped. Bottom line, we simply cannot shield our kids from every bad thing that will happen to them, physically or emotionally. But worry doesn't help. Being prepared and taking control of what we can, even it is only sanitizer, does in deed make a difference.